The summer months are a busy time in Cornwall, with lots of events taking place, and activities to try out. Here are just a few of our favourite picks for the coming weeks. Now in its ninth year, the three day polo festival at Watergate Bay takes place this weekend. The event includes three high-goal matches, Segway polo, equestrian stunt displays, a dog show on the Sunday, and delicious food and drink. GWR Polo on the Beach runs from 26th-28th June 2015 at Watergate Bay. More information here. Since 2002, the iconic biomes of the Eden Project have provided the setting for a packed season of world-class music performances. Whilst many of the sessions have now sold out, you can still secure yourself tickets to see Mötorhead with The Stranglers on 27th June and and Spandau Ballet on 9th July. Tickets also include two-day entry to the Eden Project itself. Eden Sessions run until 17th July 2015 at the Eden Project. More information here. 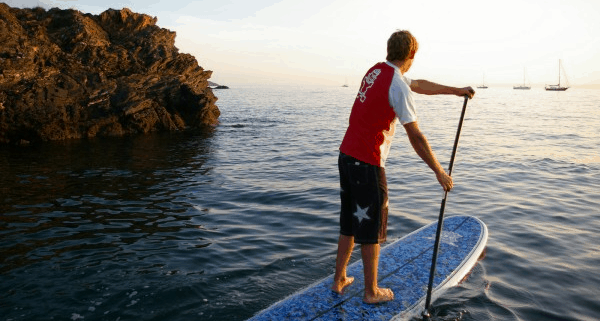 Polkerris beach is only a ten minute drive away from Fowey and the perfect location for a spot of stand-up paddle boarding – also known as SUP-ing. The Polkerris Beach Company offers a one hour lesson for £25 for beginners or those who would like to develop their skills and confidence in the water. The Polkerris Beach Company offer watersports tuition for both groups and individuals in a range of activities. More information here. Fowey is home to one of Britain’s best loved sailing regattas, which runs annually on the third week of August. Our terrace is a brilliant spot to watch the world go by on the water. Alongside the sailing events, there are lots of other things going on including a fireworks display, a performance from the Red Arrows, a fun run – and not forgetting Fowey’s very own Giant Pasty Ceremony. Fowey Royal Regatta runs from 16th-22nd August 2015. More information here. We were thrilled to be able to host the Du Maurier Big Read as part of this year’s Fowey Festival back in May. Arriving in Cornwall from London as a young woman, Daphne Du Maurier was instantly struck by the unspoilt Fowey coast. The author went on to spend most of her life in the Fowey area, which formed the inspiration for many of her short stories and novels. We have written about some of the places in our Daphne Du Maurier’s Cornwall post. Summer is a perfect time to explore the area on foot. Guests of the hotel can request walking maps and routes. Tours with a Blue Badge Guide can also be organised, via the Fowey Tourist Information. If you’re a Poldark fanatic, Cornwall is perfect territory for location-spotting. Whilst none of the major filming locations are in Fowey itself, a ten minute drive will take you to the picturesque port of Charlestown which provided the setting for some of the harbourside scenes. Many other filming locations on the north and south coasts are also within driving distance. Filming for the second series starts later this summer! With over 200 acres of beautiful gardens and ancient woodland, its not difficult to spend a day at Heligan. This summer you can also learn more about the wonderful world of foraging, as wild food forager Emma Gunn is hosting two walks on the estate. Learn how to identify wild plants for culinary use and develop the skills to forage on your own. For the more theatrically inclined, Heligan are hosting Kneehigh Theatre’s new Asylum production – 946. Based on a wartime novel by Michael Morpurgo and combining drama with puppetry and music, this is not to be missed. Wild Food Wild Walks are running on 19th July and 9th August 2015. 946 is running from 25th July – 23rd August 2015. More information here. Images by Kirstin Prisk, The Polkerris Beach Company, Ragebe via Flickr and The Lost Gardens of Heligan.